After first announcing the latest version of Apple’s mobile operating system, iOS8, in June 2014 at the Apple Worldwide Developers conference, the company released a public update of iOS8 for users this week. HomeKit, a framework that allows developers to make software that discovers, configures, communicates with and controls devices for home automation. Suggested Apps – a whole new way to leverage proximity to power real world intent. In version 8 of iOS, Apple allows you to modify two new settings meant for today’s omni-channel users: Handoff and Suggested Apps. While Handoff allows users to seamlessly transfer tasks between iOS and OS X, Suggested Apps, recommends apps for you to use depending on your current location and display them on your lock screen. Toggle on App Store for recommendations for apps you don’t own, but that your iPhone thinks will be useful. Users who have installed iOS 8 will notice that sometimes an app icon will appear in the bottom left corner of the lock screen. Swiping up on that icon either opens the app if it is already installed or directs you to the App Store listing for that app if it is not yet installed on your device. iOS 8 uses information about your current location to drive these suggestions. The idea behind this feature is to bring much more local context to your iPhone or iPad with just a single swipe. This technology is powered by GPS geo-fences and beacons. If a beacon-enabled app uses the Core Location framework to monitor for beacon regions, it is capable of detecting beacons even if it is shut down completely. This is something that became possible with the launch of iOS 7.1, when Apple announced a game-changing improvement to iBeacon. Let me simplify it further – once an app is installed it will “look” for beacons even if the app is shut down or a user has rebooted his/her phone. Let us look at how slowly Apple is bringing its iBeacon protocol to the forefront. Thus, with iOS 7, devices could constantly scan for BLE and wake up relevant apps, even if they were closed, when they come within range of a beacon; and for iOS 8, the user will be prompted to open that app directly on his/her phone’s lock screen. Thus, when in proximity of a beacon, you’ll see the beacon app icon in the bottom left corner and will be able to launch it immediately. At this point the app can also start ranging for nearby beacons, to determine the exact distance and proximity zone. How can app developers take advantage of this feature? As an app developer, all you need to do is set up regular beacon region monitoring/beacon geofence and the moment users enter the region, the app icon will automatically appear on the lock screen. To use beacon region monitoring your app needs to request permission to access a user’s location data even when it’s not on screen. This is called “always” authorization. iOS 8 requires your app to provide a description of how it will use the user’s location data. This is indeed a great boost to beacon-enabled apps. As always, remember there is a very thin line between boosting app usage and annoying users. Keep your user’s privacy concerns in mind and this feature can power your iBeacon-enabled marketing strategy. 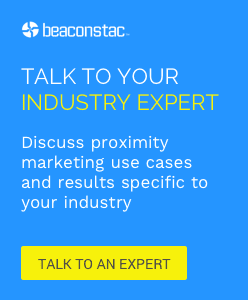 With beacons, the physical world is the new digital channel. With Suggested apps, the line between online and offline is fast blurring. As we always say : the opportunities are limitless and the game has just begun!